Nicola: We’d love for you to start by telling us about what you do and how your business has recently evolved? Josephine: Until the beginning of 2018 I was growing my own handmade business, creating country home décor using British-made textiles. However, since then, I’ve been going through a transitional period, creating my mentoring business. 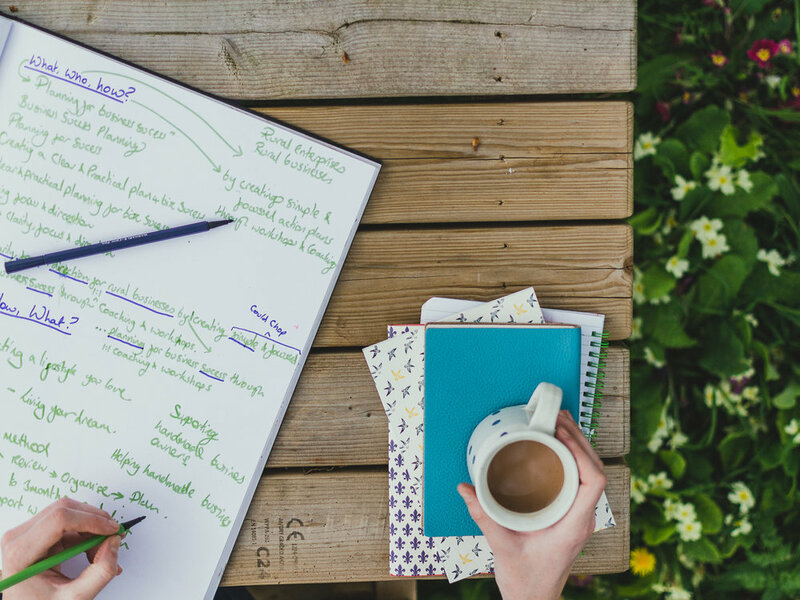 My mission is to help other handmade business owners get organised and create a plan to grow their business, so they can create the lifestyle they dream of. For the past few years, I’ve been exploring how I can live a more authentic lifestyle. I’ve worked as a project manager in marketing for the last eight years, and I love a timeline and spreadsheet, but I was starting to feel a pull towards doing something more hands-on. As a result, I set up my handmade business. This year, as I turned 30, I really started to think about what I wanted to do with my life. I dug deeper into what it was I loved about my handmade business. The making side was a creative escape I loved, but I was no master. What I really enjoyed, and where I flourished, was in the organisation and planning. Which was interesting to me as it tied back to my project management day-job. While growing my handmade business I had developed a super simple way to review, organise and plan my business so I could focus on delivering my own creative work. I’m now using this method to help other makers get organised and plan better in their business. Sometimes it’s the things that come easily to you that you don’t realise are useful to others. So far I’m really enjoying helping other handmade business owners plan to grow their business in a focused and intentional way. Nicola: What do you love most about what you do, and what inspires you? Josephine: The thing I love most about what I do is helping makers grow their handmade business so they can create a lifestyle they love. All the work I do with makers ties back to their personal goals and aspirations. I firmly believe everybody has the power to build a business that gives them a happy and fulfilled life, doing what they love. But to make that happen it’s essential to have a focused plan & clear direction. Through my work, I get to meet makers who are incredibly inspiring. There is so much talent out there and many small, creative businesses deserve more exposure. These makers get me excited about what I do, and I love helping them build a sustainable handmade business. The countryside around me is also a source of endless inspiration, and time spent outdoors always lifts my spirits. When I’m struggling to write, or I’m stuck on a project, I’ll head out for a walk with my dogs. Without fail, after about half an hour, my mind relaxes and that’s when the magic happens. Ideas start to flow, and the brick walls I had come up against whilst staring at a screen start to fall down. If I’ve had a bad day or am feeling sluggish I sometimes go out for a run (only when I’m feeling really enthusiastic). I often have to keep stopping to record voice notes of ideas I’ve had, or solutions to some of my client’s sticking points. I always come back from my outdoor adventures feeling happier and more relaxed. Nicola: How did your creative process as a maker inform your planning process? Josephine: When I was running my handmade business I found it hard to juggle the making as well as everything that comes with a creative business. For a lot of makers, their business developed from a love of their craft. I meet so many makers who live for the making but struggle to find the time or motivation to work on the other areas of their business. However, in my experience of growing a handmade business, it’s essential to have a plan and to be intentional about the areas of the business you’re giving your time. Take launching a new product for example. I found that the making is just part of what needs to be done. First I’d have the inspiration, sketch it out a few times and make a prototype. Then I’d have to source UK-made materials that fitted with my brand values and aesthetic. Using these I’d make a prototype and tweak it until I was happy. Then would come the actual production. I would make a template and some stock. This would then need photographing and those images would need editing. Product listings would also need to be written and uploaded to my website and other sales channels. I’d then need to promote my products on social media and in my email newsletter. Once the product started to sell I’d need to handwrite a thank you note for each customer, package them up and post them followed by managing my finances and paying my suppliers. So just in that one example, there are a lot of tasks that come with the making that are essential in order to grow a sustainable business. I quickly found that writing ‘launch new product’ on my to-do list made me feel so disheartened when I hadn’t done all of the above within a week. I am a structured person by nature, and I’m a project manager by trade, so after a while breaking down all the tasks I needed to do to complete a project started to come easily to me. After about a year in business, I had developed a simple and quick 3-step approach to reviewing, organising and planning my business. Firstly I would look at my stats and performance, how business was going, and more importantly how I was feeling and how my business was supporting my dream of working for myself and living the lifestyle I was craving. Secondly, I’d get myself organised. It’s too easy to let finance and the materials you’re holding run away with you, so I’d get everything back under control. Finally, I would look at what I’d reflected on, how my business was supporting my goals, what was doing well and which areas needed more focus. From this, I’d pick a maximum of three areas where I’d focus my efforts for the following three months. This half-day per month spent reviewing, organising and planning would help me feel in control and stay confident in my business. Which for me was essential to growing a business is an emotional rollercoaster! Around this time I was also meeting more and more makers who were feeling overwhelmed by all of the things they felt they needed to be doing in their business. I realised that a lot of makers I was talking to didn’t know what their most profitable product was, or weren’t selling their beautiful and unique products online because they didn’t know where to start. I knew that the simple 3-step approach I had devised for my own business could help other handmade sellers too. Nicola: Can you tell us about where you live, the space you work from and what a day in your life looks like at the moment? Josephine: I live in the Test Valley in Hampshire, UK. It is a gorgeous area surrounded by streams and rivers, and with lots of willow trees and wildlife. There are plenty of cosy country pubs in the area for a warming Sunday lunch in winter. In summer the nearby town of Stockbridge is the perfect place to meet friends for coffee, and have a mooch down the high street which is full of independent shops. However, as an introvert, I’m most happy when I’m at home, emerging from the house to go for a walk or hang out in the garden. Our house is situated up a farm track where it’s very quiet, apart from the odd tractor. My workspace is the box-room in our house. In here I just about have space for a desk to work from and storage for all of my fabric, photography props and sewing machine. At the moment my boyfriend and I are renting so I can’t wait to have a place of our own where I can create my dream workspace. My favourite thing about where I live is the birdsong. It makes the ultimate alarm clock. At the moment I work part-time as a project manager for a conservation charity. I love working with a brand whose ethics I believe in, however ultimately my goal is to go full time with my business. The rest of the time I’m working on growing my business. Often my days will be spent writing for my blog, planning workshops, creating course materials and taking photographs for my website. Getting better at photography is something I love at the moment and fulfills another way of getting creative in my new business. Working on my business has become a complete obsession. I love it! I’m getting better at making myself slow down but I’ve got a long way to go. I’d like to make Sundays a day off, but at the moment I’m always photographing or writing on the weekends. Nicola: When you aren’t working and creating what is your favourite way to spend your time? Josephine: You’ll usually find me in a pair of wellies with a cup of tea in hand. I love getting outdoors. The garden is my favourite place in summer and there is a section of the river nearby where you can swim (only on very hot summer days for me)! I love going there. The water is crystal clear and the dogs enjoy splashing around in it. 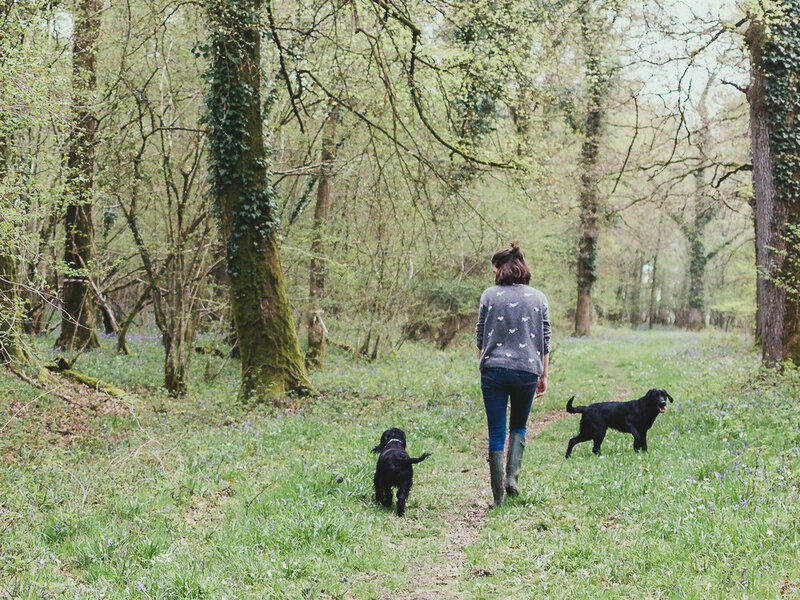 Walking the dogs is my favourite way to switch off and it’s when I feel most connected with nature. My boyfriend and I have three dogs; a Springer Spaniel who’s now 12 and enjoying a slower paced life and lots of cuddles, a Sprocker Spaniel who’s got way too much energy, and a very loveable Labrador puppy who’s eight months old. Having the dogs around makes it a bit of a mad (and muddy) house at times but we couldn’t live without them. We’d have nothing to talk about! Since my handmade business has taken a backseat I’ve had a real hankering to make all sorts of things again. I love to cook and sew. I’m not a master at either but it gives me great pleasure to make something with my hands. The seasons always inspire me to create. Whether it’s a summer dress, a winter wreath, blackberry jam or sloe gin it will always be triggered by the changing seasons. I also love to forage for seasonal food and foliage. I think it’s magical that you can make the most beautiful things with what’s in nature. Josephine: If you haven’t started your creative venture yet, the best advice is to just start. I know this sounds clichéd, but as soon as you take action you’ll start learning more about yourself, where your strengths are and what you want more of in your life. If you’re already deep in the throes of working on your creative venture, and you’re feeling a little lost or overwhelmed, here’s a brief run through of my 3-step process to review, organise and create an action plan to take your creative business or project forward. Have a look back over the last three to six months. Ask yourself why you started pursuing your creative dream and what your personal aspirations and goals are. Is the work you’re doing still on track with that? Check in with your gut instinct. How are you feeling about your business/ creative venture? It could be you need to adjust what you’re doing to fit more of what you love into your work. Or is there something you’ve been meaning to have a go at for ages you think you’ll be great at? Look back at your stats, website traffic, sales, income, outgoings, most successful blog post, favourite product you’ve made. Are there any learning’s you’ve made over the last few months you can build from? Jot it all down in a notebook and see if there are any recurring themes, and any words or phrases you’ve repeated. Have a think about where your opportunities lie. You might have noticed you get your best sales at markets and that you love chatting to customers one to one, so you want to fit more markets in. Or it could be that you’ve seen a gap in your product range and you want to create that new product line you’ve had on your mind for ages. Pick out a maximum of three areas you want to focus on over the next three months. Start recording your progress each month. This doesn’t need to take more than 20 minutes and it will give you something to look back over, so you can see just how much you’re achieving over time. Keep a note of your website traffic, most popular product, income, outgoings, most successful blog post, social follower numbers etc. This can also help you spot trends or areas where you’re doing really well, as well as areas that might need a bit more love. Take your three focus areas and turn them into goals for the next three months. It might be that you want to create a new product line or start learning a new skill. Break each goal down into actionable chunks. If one of your goals is too big to achieve in a three-month period, break it down into something smaller. Plot each individual action you need to take over the next three months into a diary, wall planner or calendar, and you’re ready to get going. And remember to reward yourself at the end of those three months! You can find out more about Josephine on her website or you can follow her on Instagram and Pinterest.